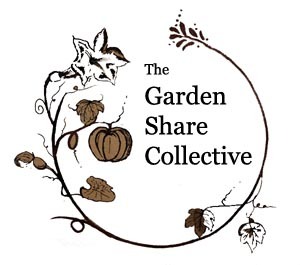 Hello everyone and welcome to another round of Garden Share Collective hosted by Kate, Kyrstie and Lizzie. The month of June was a slow one, workwise, in the garden and a dry one too, with just over 16mm of rain recorded for the month. The peas that I sowed in May have sprouted with about a 95% germination rate. The Green dragon broccoli hasn't done anywhere near as well this winter, they are only 1/3 of the size of the ones I grew last year and the heads are tiny. I'm hoping they will get a little bigger than this before they have to be cut. The Green Sprouting broccoli is coming on. 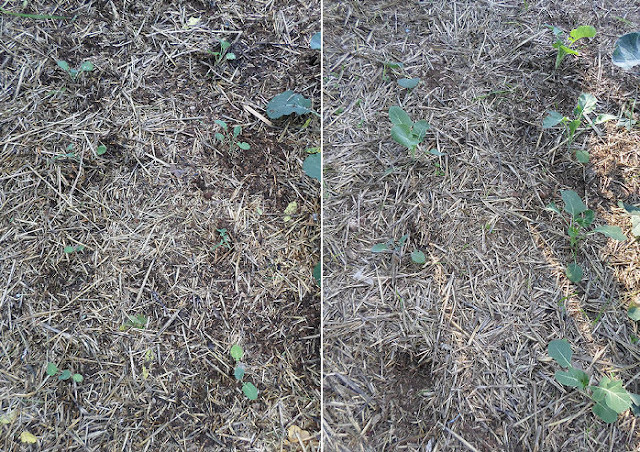 Broccoli in May on the left and June on the right. The rhubarb is still producing stems, normally by this time of the year it has died down, but with the weather being all over the place as it has been I'm not surprised the poor plant is confused. I have self-seeded tomatoes popping up all over the place, some of which are flowering. 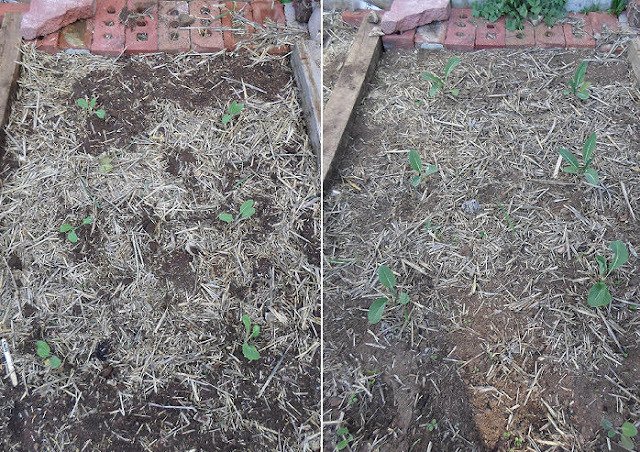 At last count, there were fourteen, if they all survive I won't have to worry about seeds or seedlings come spring. I pruned the grapevine back and I'm thinking I might have cut it back too far, I guess only time will tell. I will be repotting it into a half wine barrel soon and if it doesn't give me any fruit this year (it's five years old) it will be going into the compost. I had a very small harvest of ginger, I had been expecting more considering how lush the plant was. Apart from the ginger, pickings have been slim, almost non-existent this month, hopefully things will get a move on in the garden and next month's harvest will be bigger and better. I finally got around to planting the potatoes, 6 each of, Kestrel, Blue Royal, and Red Delight and that's it, it's just a matter of waiting now. My hens Rosie and Ginger have been through their moult and they looked very tatty this year. The feathers have grown back now and they are looking like their old selves again, I just wish they would start laying. Rosie and Ginger doing their best to turn over the new compost bin. That's it for this month, I will see you all again next month.